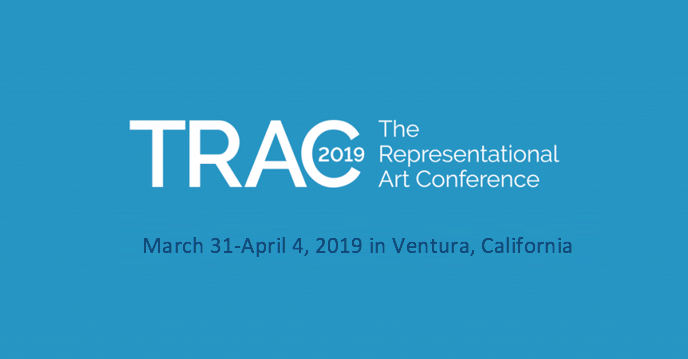 The Art Renewal Center (ARC) has announced their 13th International ARC Salon Exhibition. The show began in 2004, when ARC received over 1,100 entries of exceptional quality from all over the world, dramatically exceeding expectations. From then on the number of submissions grew. This year’s Salon received over 3,600 entries from 69 countries. The show will travel from New York’s Salmagundi Club to Sotheby’s in Los Angeles, then go across the Atlantic to MEAM, the Museu Europeu d’Art Modern, Barcelona. The winning paintings of the salon are a delight. Canvases by Julie Bell and Joseph McGurl focus upon the natural world. 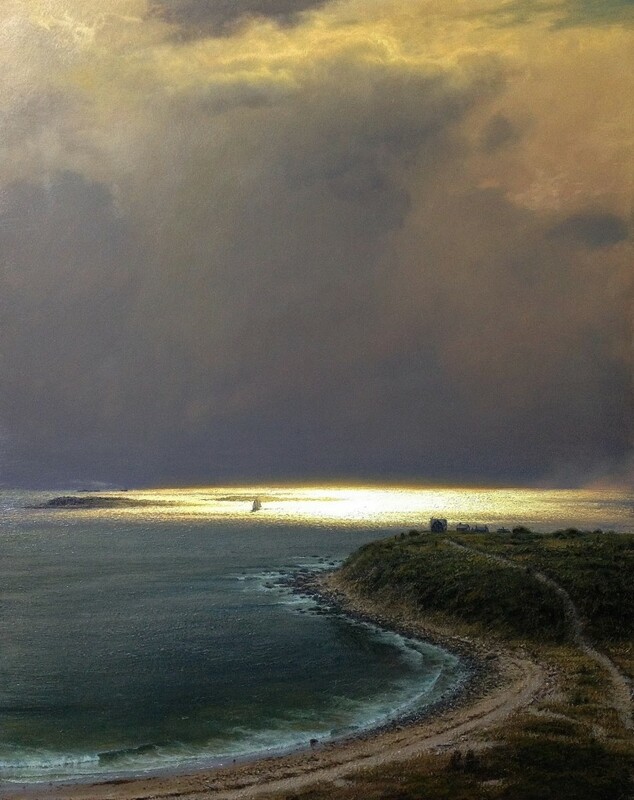 Both of these artists’ paintings capture a beautiful moment in time – the taming of a wild beast in Bell’s Speak Softly and Earth’s natural beauty in McGurl’s Land, Sea, Earth, and Sky. 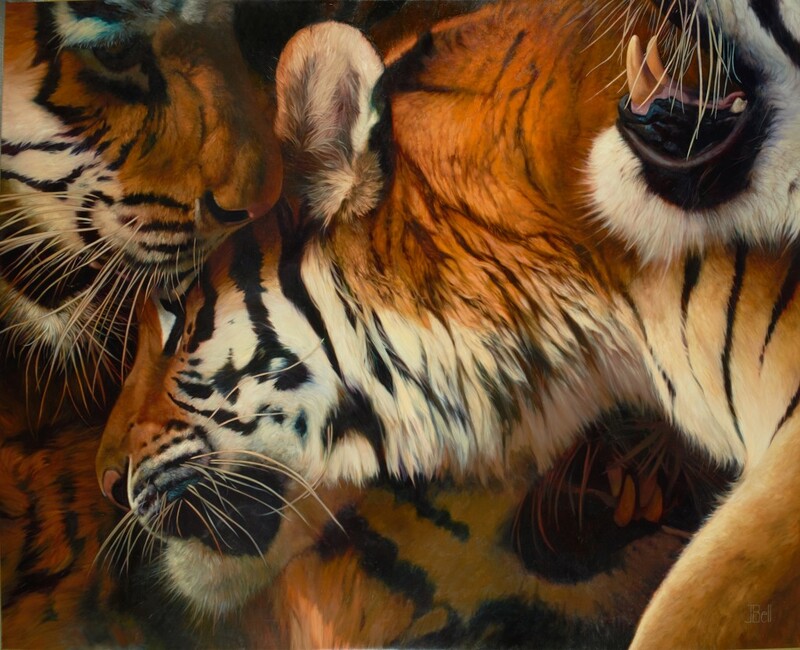 Bell’s tigers appear gentle, almost inviting the viewer to join them in their embrace. Speak Softly almost made me feel afraid to utter a sound that might disturb the play of these powerful animals. Every stroke of the brush adds to the soft pelt of the tigers and makes it appear as if one could reach in and feel the thickness of the fur. However, the subtle hints of their powerful jaws and teeth lurk as a reminder of their true threat. First place prize-winner McGurl’s Land, Sea, Earth, and Sky captures a moment of serenity and natural beauty. The landscape balances the last light of day as it is shared between the cool ocean water and the soft clouds. By including small man-made structures overwhelmed by the vastness of nature, the painting embodies the philosophy of the sublime. Man is humbled by nature. Aurelio Lopez’s Painting Old Chinese Pottery is a clever piece of trompe l’oeil. Our experience of what appears to be a conventional still life suddenly changes when the teacup on the far-right leads us to realize that the painting captures the moment of an artist finishing their work. A kneaded eraser, pastels, pencil, and pencil marks brilliantly conspire to give the game away. Nick Alm’s Elevator – winner of the purchase award – turns a mundane ride into a spectacular piece of figurative art. Everyone has had the experience of an awkward elevator ride, where soft music plays and everyone avoids eye contact with one another. Alm’s use of light and shadow transforms this into something more romantic, an almost religious moment, full of empathy for the riders. Katsu Nakajumi’s Woman in the Forest appears to be a representation of a dream state rather than an everyday occurrence. The forest floor disintegrates as the beautiful woman stands in its remains. A tremendous painting by Randalf Dilla (featured image) provides an exceptional example of the power of the imagination in representational art. His Tribute to Luna treats us to the sudden whiplash of a group of people as if they are being pulled back in time. Here we must rely on the imagination of the artist, whose realist technique allows imagination to spring to life. Every detail is painted with a precision that deceives our sensory perception of reality. Each dramatic figure and object, whether a pigeon, a leaf, or a floor tile, pulls our attention across the painting, ending at the final figure laying chained on the floor. The 13th International ARC Salon Exhibition will be on view at the Salmagundi Club, 47 Fifth Ave., New York, NY, September 21—October 2, 2018. A public opening on Saturday, September 22 from 11am – 3pm. Entry is free. The exhibition will then be on view again at Sotheby’s Los Angeles (2029 Century Park E. #2950, Los Angeles, CA) from December 4—13, 2018. The opening reception will be December 4 from 6pm—8pm. Entry is free. The final stop for the live exhibition will be at the MEAM Museum (C/ Barra de Ferro 5 Barcelona, Spain) from February 8—March 31, 2019. The ARC Award Ceremony and Opening Ceremony on February 8, 2018 starts at 7pm.